While some people are breaking glass ceilings, others are bending them into their own creation. 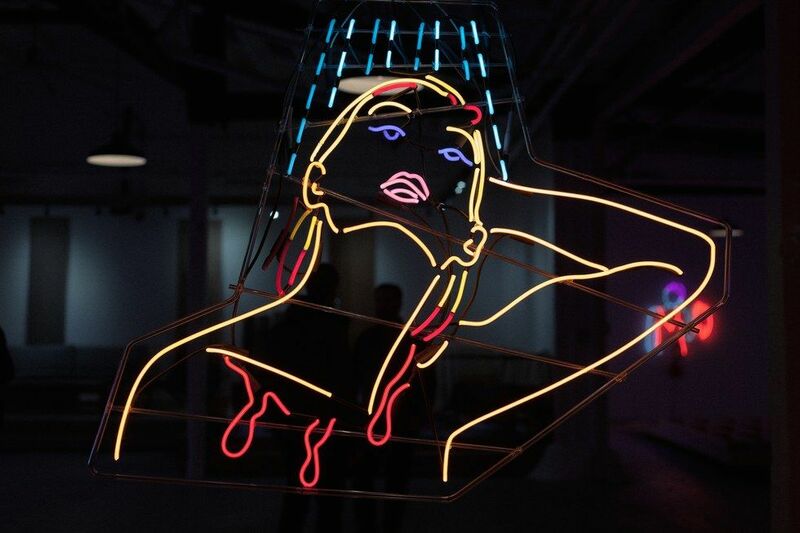 Take Brooklyn-based artist Kate Hush, who designs and fabricates towering creations made of neon -- forming glass and light into vibrant femme fatales, whether they be strutting their stuff or secretly concealing a knife. You can get a taste of her Times Square meets film noir creations in Female Behavior, her solo show at Cooler Gallery, an art space within a repurposed industrial icebox outside the Brooklyn Navy Yard. We caught up with Hush after the opening of her show to talk men on the internet, being a nasty woman, and going from animating GIFs to bending glass. You started by making neon GIFs online. How did you go from that to working with actual neon? One of the first fake neons I ever made was a poster design. That's when I started playing with [making neons] digitally. My husband knew I was into neon, so a couple years ago he bought me a gift certificate to take a neon bending class for the weekend, [and] that's the first hands-on experience I ever got with it. That eventually turned into a job; I work there now. But before I ever made work like I'm making now, I started on Tumblr first. I started becoming an expert on making the [neon] layouts, and thought I could make them look even more like neon [online] without having to pay the insane amount for the actual neon. Even working there, it still wasn't that feasible. I started that because my husband works at Tumblr. I didn't even have a Tumblr, but he was like, people are really into that, you should definitely start doing it. So I started taking TV characters and stuff and turning them into neon, thinking that's how I'll start getting views and followers. It eventually turned into me making my own stuff and turning it into actual neon. The first one that I think blew up was a Twin Peaks one. People on Tumblr love Twin Peaks. How long does it take to make a neon, approximately? 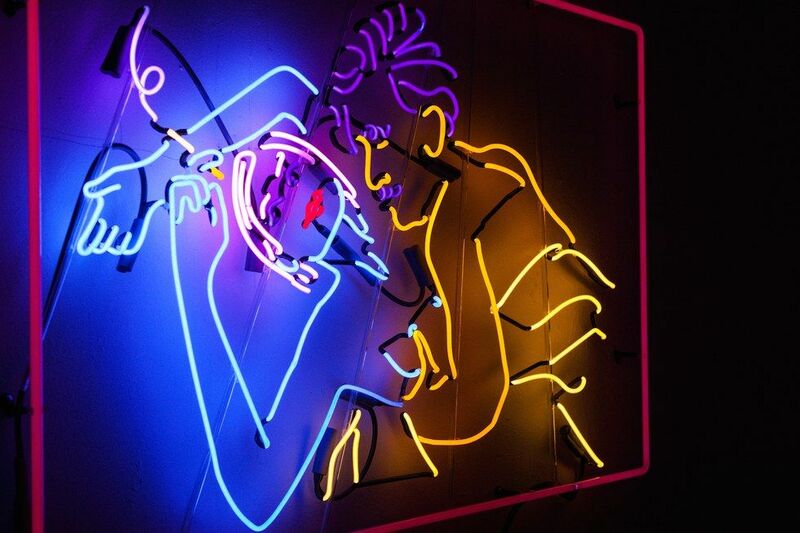 The funny thing about neon is when you're in the process of making it, if you get a crack in the glass or it breaks, it's not like painting or drawing when you can just erase it or go back over it. You have to start all over again. So some can take a day, and some can take weeks. It's a team effort; It's really hard to do alone, you have to have people help you bend, help you pump it, help you paint it— the painting [creates] the parts you don't want lit up. That's basically me sitting at a table for hours with a tiny paintbrush painting out the sections of glass I don't want lit up. Did you make these pieces specifically for Female Behavior or were they preexisting? All of them were preexisting except for one; the brand new one was the woman taking her wig off, which I was thinking about making for years and finally figured out. The layered animated pieces, they're kind of hard, you have to do it in clear glass— with clear glass, when one section is shut off in the animation you can see the one behind it, [as opposed to] other glass that's coated with a powder on the inside which would block out the layer behind it. I've noticed basically all the women you create are very similar aesthetically. Was that a purposeful design, to make them all sort of traditionally feminine looking? I guess it's the archetype that's ingrained in me, from film noir and things like that. The silhouette of those women is really similar, and I guess that's what I'm pulling from. The curve… It just works so well with the glass. I also noticed a lot of subtly violent imagery, one of them has a scratch on their arm, there's blood droplets in others, etc. What was the motivation behind that? I feel like most people's association with neon is signs, business products and stuff. 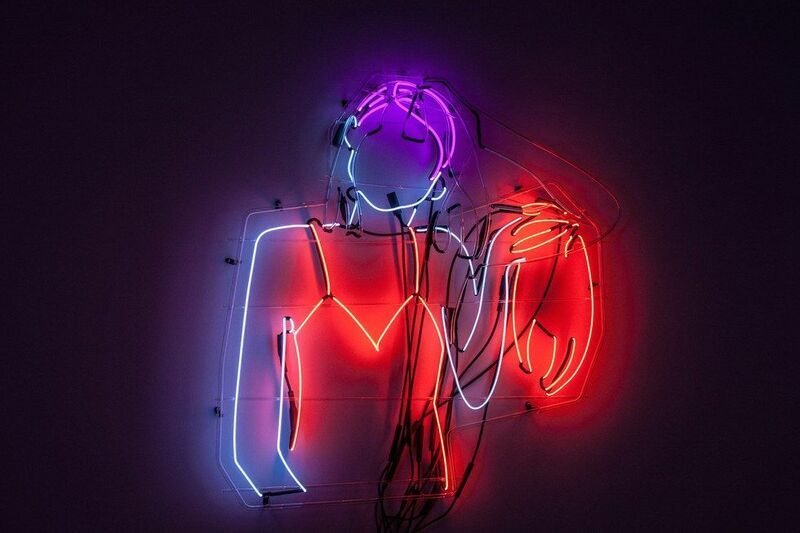 Do you ever encounter anyone undermining the artistic nature of your work because neon is often so tied to function? Not personally. Working full-time at the neon shop, I've heard people speak poorly of other's artwork that's just block letters and stuff, but I've never encountered that because I don't do lettering or words. I think people would have a hard time associating my stuff with commercial signage. You mentioned earlier about neon production costing a lot. Is it more feasible for you now? As the years went on working in the neon shop, I now am at a point where I have a hand in it so much, a lot of it is just me doing the majority of it myself. It's really rare for an artist to bend their own neon. There are a couple people in the city I know who do it, but most people who do work in neon have to get it completely fabricated. You spend a week in the neon shop, I think you'd see why it was so expensive. It's just the labor that goes into it. It's just an insane endeavor. I was getting a piece ready for this show and it broke a day before install and I just had to scrap it. There was no saving it in time. That's the heartache of it. You have to really learn to get over it and let go. The description of your show mentions "triboluminescence," or light being created via the breaking of bonds. Does that happen in the actual neon-making process? Not technically. It is real though, it's a type of light emission. Did you ever chew on Wintergreen Lifesavers in the dark? That's triboluminescence. So I'm kind of poetically applying that to my work, more in an emotional way. I know. It's crazy, I've been doing this kind of stuff for as long as I can remember and now it's so en vogue, to be a nasty woman. And I'm like, hello, I've been a nasty woman forever. It's funny, the way I came up with the name for my show (Female Behavior) was that I was looking at websites about behavioral boarding schools for young women, and just reading the lists of all the things your teenage daughter is doing wrong… I was like, these girls sound fun. This is the female behavior we're trying to get rid of? My art is also a reaction against these men's groups that really have roots in these weird websites where they just go on and on about how horrible women are; those people who are just convinced that all women are crazy and we owe them something. And I'll find myself reading these things for a while, and I know I'm probably supposed to get mad at them, but it just makes me laugh. Sometimes I think men's biggest fantasy is not sexual, it's a woman attacking them! Just so they can be like, 'I was right! They are crazy.' I think their biggest fantasy is a woman getting behind the wheel of a car and running them over just so they can be like 'Yes! Vindicated!' as they're dying. Kate Hush: Female Behavior is on view through January 31 at Cooler Gallery in Clinton Hill, Brooklyn. 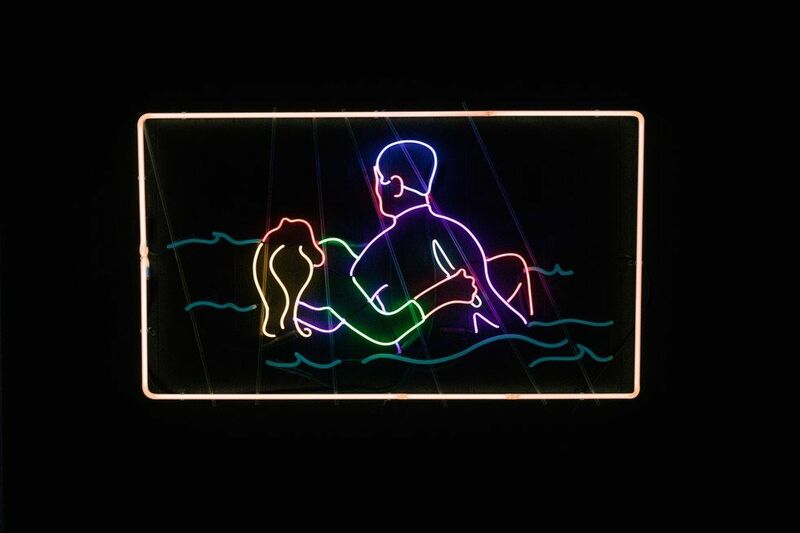 She will be teaching an 8-week neon course entitled Fluorescent Forms alongside artist Valerie Shusterov at Brooklyn Glass beginning February 16.